ARIEL: The Shimmering Star Necklace: Ariel's young friend Marina is missing! The only clue she left behind is a mysterious diary entry about a secret new friend. Now Ariel must follow the clues along with Sebastian, Flounder, and Scuttle in order to find Marina in this delightful princess adventure! BELLE: The Mysterious Message:It isn't easy being the prisoner of the fearsome Beast, but Belle is making the most of it. There are so many rooms to explore in the elaborate castle - including an amazing library. This may not be so bad after all! Things get even more interesting when Belle discovers a secret message hidden in one of the books. She soon realizes she's hot on the trail of a decades-old mystery! Will Belle, with the help of Lumiere, an enchanted candelabrum, and a teacup named Chip, be able to solve this beastly case? 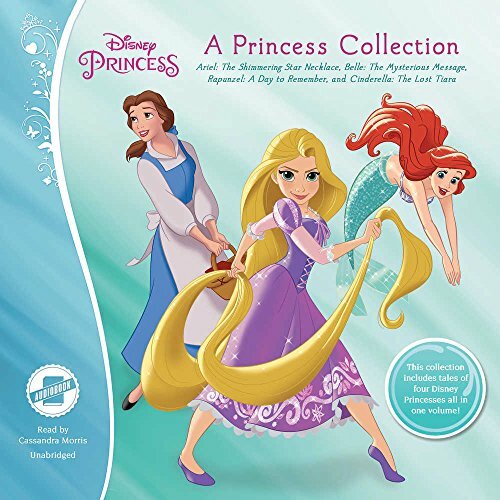 RAPUNZEL: A Day to Remember: Rapunzel has lived in her secret tower in the woods for eighteen years. Not one to remain idle, she keeps busy with music, painting, cooking, and even astronomy. With her best friend - a chameleon named Pascal - to keep her company, and a vivid imagination to keep them both entertained, Rapunzel has lots of adventures to dream up! CINDERELLA: The Lost Tiara: When a palace messenger brings word that Cinderella's new grandmother-in-law is coming to visit, everyone in the castle scrambles to prepare for her arrival. Cinderella wants everything to be perfect for her first royal guest! As a special surprise, Cinderella decides to wear the beautiful tiara that Grandmama sent as a wedding gift. But when Cinderella goes to the royal vault, she discovers the crown is missing! Can she find it before Grandmama arrives at the palace? View More In Fantasy & Magic. If you have any questions about this product by Disney Enterprises, Inc. and Blackstone Audio, contact us by completing and submitting the form below. If you are looking for a specif part number, please include it with your message.